One of the UK’s leading marketing services providers, mda has over 25 years’ experience and a commitment to quality and innovation. They continue to design, source, store, and deliver Point of Sale and marketing materials to companies across the world, with further expansion plans for 2015 and beyond. 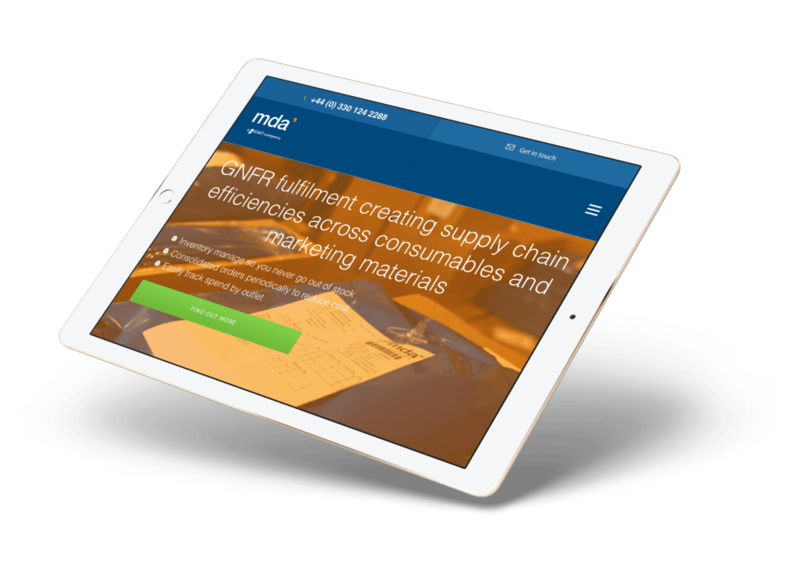 With over 3 million orders a year, and 600,000 square feet warehousing capacity with 60,000 locations, mda were looking to mark 25 years of success with a website which would display their experience, expertise, and company culture of striving towards exceptional results. New business objectives were set for the next 3 years: to retain clients, become famous for exceptional service, to consolidate the UK and European marketplace, and capture more organic growth. A new website was required to meet these objectives, one which boasted the latest software features, SEO, and mobile integration. The site needed to clearly explain mda’s services to their key markets, whilst standing out from their competitors. The redesign had to integrate TFS whilst improving the appearance, functionality, and sales growth of the business. Added to this, the latest SEO techniques had to be matched with an accessible CMS, a mobile-friendly design, and social media formats. Effectively communicating and organising mda's solutions and services had long been a problem. Presenting hierarchy and categorisation had proven troublesome, and from a content perspective they had often been left to present large walls of technical content on a single page. By organising pathways through the wesite for each customer profile, mda can now successfully communicate an evolving story of the benefits and solutions they offer. Its story is now disclosed successfully through the site, and users can make appropriate choices based on this clear information. Delivering the best possible UX is always at the top of our agenda. For mda, the principle was to make the content available in a visually rich and easy to digest manner. By doing this we could ensure readers wouldn’t become overwhelmed by the information on display, as unnecessary clutter would no longer be an issue. As part of our cutting edge web design and development solutions, the user journey has been tailored for the many devices in widespread use (smartphones, tablets, desktop). Due to this the key information from mda had to be organised, based on the device screen real estate, so it is displayed to visitors in a clear and accessible manner. Case studies are central to MDA’s service – they depict the quality work they have provided, and this can help win them new clients. As a consequence, their extensive portfolio had to be faithfully represented using visually engaging design and compelling content. The individual case studies also needed to clearly reflect the quality brands MDA has worked with, which led us to utilise striking colour schemes set alongside sparse, but complementary, imagery. As MDA has a unique history working with internationally renowned clients, this helped shape the vibrant colour schemes used throughout the new site. With brands such as Coca-Cola, Nestlé, Three UK, and AG Barr, the availability of renowned brands and vibrant designs ensured the visuals would be appealing and representative of the quality service on offer. Take a look at what Robert has to say about us. mda appointed Soap Media to design and relaunch our new responsive website, and right from the start the expertise, skill and support they have injected into our business has been remarkable. The time they had taken to understand our business and its objectives, coupled both with the complete confidence they gave us on all technical and user experience areas, particularly meant that we were truly excited about working with Soap Media, because we knew we were going to get an outstanding solution, something they have delivered for us in every way. We have absolutely no hesitation in recommending Soap Media, indeed we couldn't recommend them highly enough and are actively investigating other ways we can work with their team following this fantastic first experience.